Farmgen is a leading independent UK company specialising in developing, managing and operating Anaerobic Digestion (AD) plants, which use a natural processes to generate electricity. The company is now rolling out a £30 million investment to create the biggest Anaerobic Digestion ‘energy farming’ expansion programme in Britain. Anaerobic Digestion technology has achieved great success on the continent and there are more than 4,000 AD plants operating in Germany alone. AD mimics the inner working of a cow’s stomach to produce methane-rich gas – known as ‘biogas’ – which can be burnt in a generator to produce renewable electricity and heat. The end product of AD is a balanced, fibrous natural fertiliser called ‘digestate’ – which can be spread on land to provide a major proportion of yearly crop nutrient requirements. 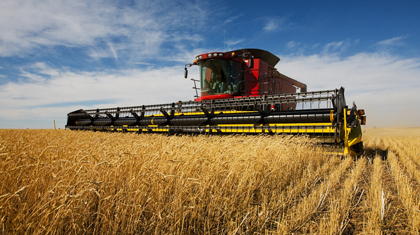 The AD process utilises normal farming techniques and equipment to provide the three main energy crops – maize, triticale and purpose grown grasses. The biogas created is used to fuel a Combined Heat and Power unit to produce electricity which is then exported to the National Grid. Farmgen projects involve the creation of AD plants that are carbon-neutral. The amount of biogas produced depends on the type and quality of feedstock, in particular the amount of dry organic solids present. The plants are largely automated with computers controlling the gas engine and digester feeds. The only requirement of the plant operator is to fill a hopper with silage or energy crops once a day. 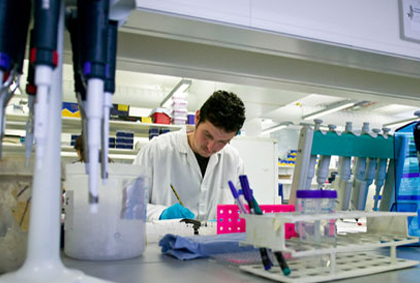 Specialist plant maintenance is carried out by expert external technicians, although operators can carry out some basic work. Plant sizes around 500kW are common in Germany, however the plant size is tailored to the size of the farm - or co-operative of farms. Farmgen’s experts believe the UK’s farming sector could sustain up to 1,000 AD plants – using marginal land to diversify into ‘energy farming’. These plants would produce organic silage and help to protect and sustain existing land used for food production. AD plants provide jobs, bring inward investment into the rural economy and support the need for renewable energy sources. The process uses locally produced crops and crop residues. 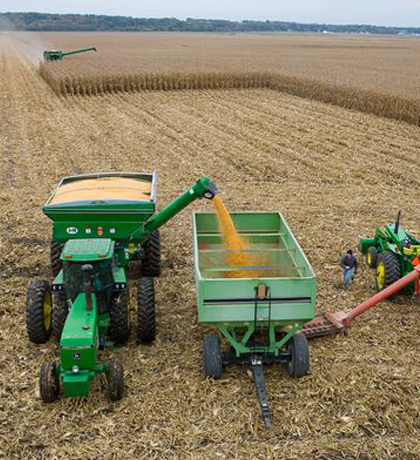 The technology – in terms of appearance and operation – is among the most ‘farm friendly’ available. The units used are designed to mitigate their impact on the surrounding environment. Compared to other alternative renewable energy generators, such as wind turbines, it has significantly less visual impact. The bio-product of the plant is returned to the surrounding land as fertiliser to support the growth of the following year’s crops – reducing the need for carbon-intensive industrial fertilisers, which are a major source of greenhouse gas emissions. It also has far less odour. Livestock farmers faced with investment challenges under the Nitrates Vulnerable Zones legislation can benefit from an AD plant – boosting storage capacity and improving incomes from renewable energy sales. Simon comes from a dairy farming family, based close to Lytham on the Fylde Coast of Lancashire. After graduating from Hull University in 1983 with a BSc (Econ), he joined the then Yorkshire Electricity Board, with whom he qualified as a Certified Accountant in 1987. In 1996 he formed Spice plc with 12 employees and one customer, by 2008 Spice turned over 400,000,000, made 40,000,000 and employed 4,500 staff worldwide and entered the FTSE 250. In 2010 Spice was purchased by Cinven and taken private. Simon then formed Greengen Group. The plant consists of three 3,000 tonne Glass-Fused-To-Steel AD Tanks complete with industry-leading BIODOME® Double Membrane Roofs. The biogas that is produced as part of the AD process is captured in the BIODOME® Roofs before it is cleaned and sent to the CHP Unit, where electricity is produced for exporting to the National Grid. The plant uses grass and maize silage grown on farm and in the surrounding area to produce 2.0MW of electricity, enough continuous power for more than 4000 homes, producing a significant boost to Cumbria's rural economy and contributing to the business as a whole. The plant is part of Farmgen's £30 million investment to create the biggest 'energy farming' expansion programme in Britain. KIRK designed, supplied and installed two Concrete Digester Tanks (2,280m³ and 2,700m³) complete with industry-leading BIODOME® Double Membrane Roofs and a smaller Glass-Fused-To-Steel Buffer Tank. The animal foods and the slurry from the farm go into the digester tanks to be treated. The biogas produced as part of the AD process is captured in the BIODOME® Roofs where it is treated and electricity is produced to generate 800KW, enough to power the plant itself and up to 1,000 homes in the local area. Farmgen enjoys a unique position in the sector as part of the acclaimed Greengen Group. 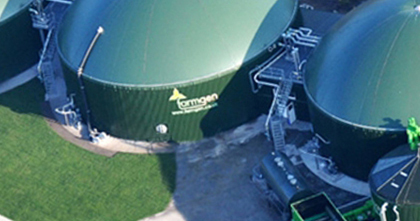 On the renewables front, Farmgen works alongside Greengen Group companies including Kirk Environmental and LGEnergy Group, continuing to build on its unrivalled expertise in Anaerobic Digestion (AD). LGE was originally created as “Local Green Energy” and specialised in trading renewable energy on the market. 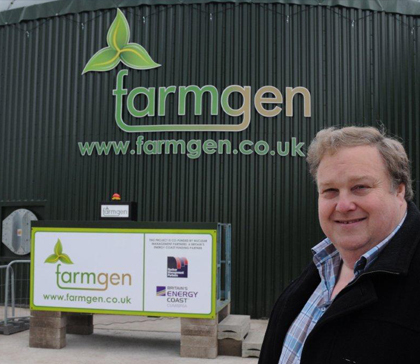 LGE has close relationships with the highly acclaimed Greengen group through joint CEO Simon Rigby, and trade the Farmgen branch of the business’ renewable energy produced from Anaerobic Digestion facilities. The reliance on in house produced market intelligence ensures a high level of accountability within LGE’s trading and operations. Kirk specialise in providing liquid and biogas storage solutions with all ancillary equipment as a specialist design & build contractor for water, wastewater & bioenergy infrastructure. Kirk works in partnership with clients, main contractors & process technology providers to construct projects throughout the UK, Ireland & Mainland Europe. Energy Trader Daily (ETD) is the leading UK energy trading desk which examines markets such as; carbon, coal, oil, electricity, and utilises established methodologies, in order to deliver exceptional market intelligence, focusing on both fundamental and technical analysis. ETD offers a wealth of knowledge, real time streaming direct to your desk, and an expert trading analyst team. © 2014 Farmgen. All rights reserved.